The success of Ryzen caught the attention not just of enthusiasts and gamers but of system integrators and retailers who until then had typically only offered fairly low-end AMD-based pre-built PCs; the high-end market was dominated by Intel. That’s no longer the case, and with the second-generation Ryzen processors that launched today, AMD looks set to retain a strong position in mainstream gaming systems like the Magma Pro offered here by PC Specialist. For £1,500, it pairs the new flagship AMD Ryzen 7 2700X with the punchy Nvidia GTX 1080; it’s clearly going to be a powerful all-rounder. 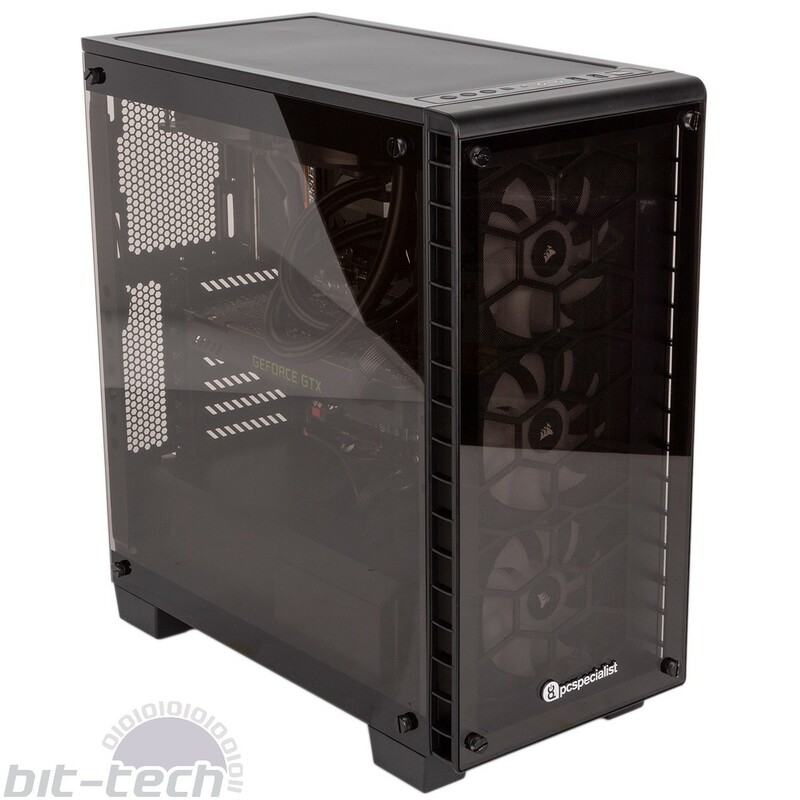 The Magma Pro considers form as well as function, as it’s presented in the lovely Corsair Crystal Series 460X RGB, a mid-tower with a premium edge thanks to tempered glass front and side panels. It has full dust filter coverage with easy access for cleaning and two front USB 3.0 ports – no USB 3.1, sadly, but this is taken care of on the rear panel with both Type-A and Type-C connectors. 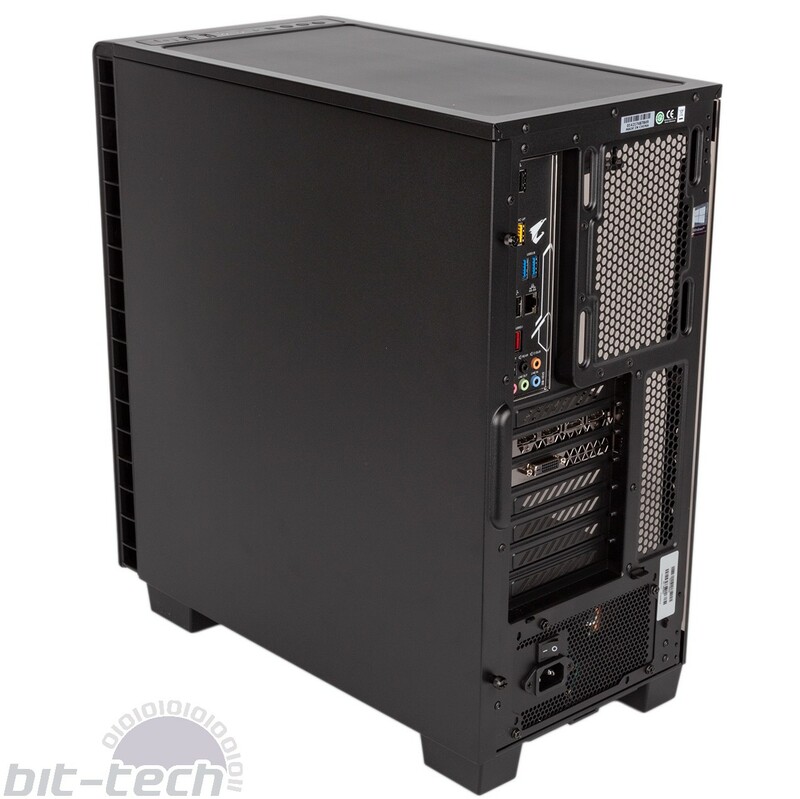 Our only gripe with the case here is that PC Specialist attached its logo at a slightly wonky angle on the front. Sporting eight cores and 16 threads with a base clock of 3.7GHz and a peak boost frequency of 4.3GHz, the Ryzen 7 2700X is a mutli-thread beast, as evidenced by our review. Unfortunately, despite it being unlocked, PC Specialist has not overclocked this CPU for the Magma Pro. It’s still fast without it, but lighter threaded applications including games often benefit from forcing all cores to run faster. Thankfully, the memory it’s paired with is pretty nippy at 3,000MHz – as we showed, a fast memory kit is a great addition to a Ryzen processor. An even faster kit would be nicer, but given the cost of memory at the moment 3,000MHz strikes a good balance. The Gigabyte X470 Aorus Ultra Gaming will probably be a popular motherboard given its relatively low retail price, and its feature set is solid. It lacks Wi-Fi and has just a single LAN port, but the audio is the preferred Realtek ALC 1220 codec, it has a good number of fan headers and USB ports, and the heatsinks are generously sized. The case and motherboard are both RGB-equipped, although they’re not synchronised. The Corsair chassis has a trio of 120mm RGB fans that glow pleasantly through the front glass panel, and these have external hardware control buttons on the front I/O for speed, colour, and effect. 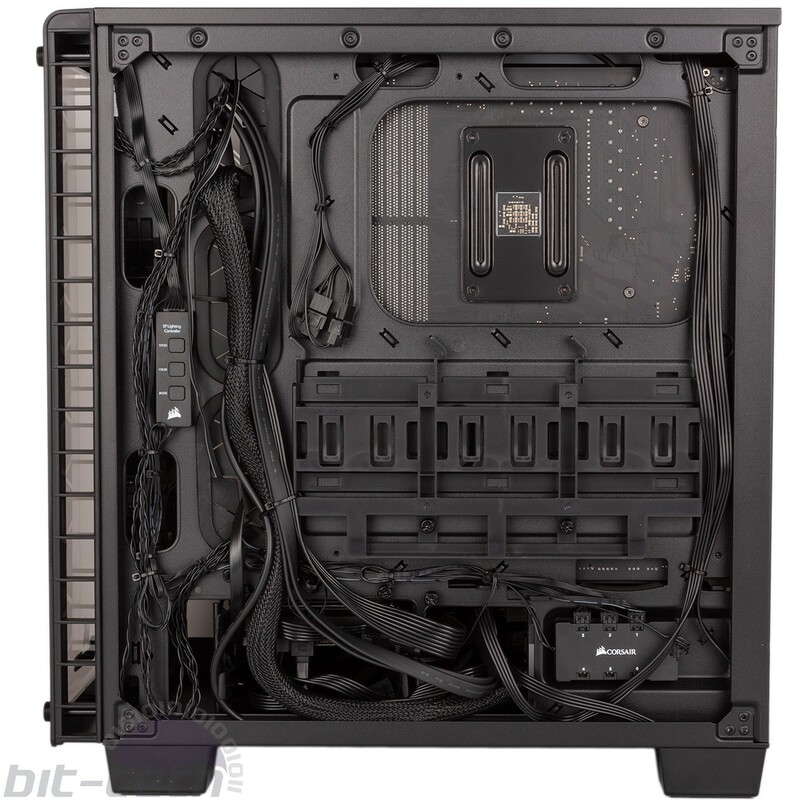 Meanwhile, the motherboard has its own onboard lights, and PC Specialist has expanded this with dual 50cm RGB LED strips – one above the window, one below it – via the onboard RGB header. The setup allows you to set one colour/effect for the fans and a different one for the internal lighting, which seems sensible, as any more than this tends to look garish. One final RGB-equipped component is the CPU cooler, the trusty Corsair H100i V2 all-in-one with its illuminated pump logo. 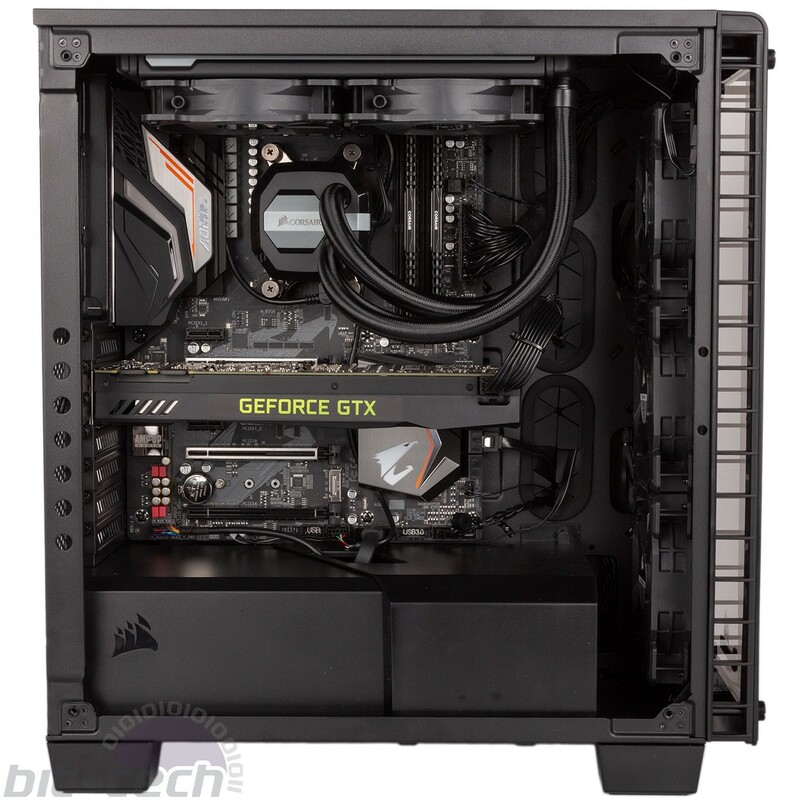 It has a 240mm radiator cooled by dual 120mm exhaust fans that neatly complemented the trio of intakes; the AIO is connected to the CPU fan header while the case fans plug directly onto the motherboard. An internal USB connection allows you to control it with Corsair Link (not installed by default), while Smart Fan 5 from Gigabyte has great features for chassis fan control. We do think the overly thick tubes of the H100i V2 are a bit dominating, but it should do a good job nonetheless, especially as the CPU isn’t overclocked. Moving to the GPU, PC Specialist has used a bog standard GTX 1080 from Zotac with a blower-style cooler. It has no backplate and no overclock. Obviously this isn’t that exciting, but any GTX 1080 is still going to pump out excellent frame rates at 1080p and 1440p and even at 4K in less demanding titles. Installed in a reinforced PCIe slot, it shows no obvious signs of sag. Windows 10 is installed on a 256GB Samsung PM961 NVMe M.2 SSD. 512GB is nicer these days, but in a £1,500 system with the hardware here, we can’t complain. If you can’t see the drive in the photos, it’s because it’s blocked by the GPU. It does have a thermal shield secured to it to dissipate heat, but even so its position isn’t thermally ideal – we would have used the available lower slot. It’s backed up by a 2TB HDD installed discreetly under the PSU shroud, leaving the case with one spare 3.5” slot and three 2.5” bays. The Corsair 650W PSU is more than capable, and an 80 Plus Gold rating is suitable for the price point. Looking inside, we find the Magma Pro to be a little bit cluttered. The massive cooling tubes don’t help, but the HD audio cable and the USB wire from the H100i V2 could be neater, we feel. Overall, though, the cable routing job is still good. PC Specialist’s presentation is on the whole very good, as the packaging is secure and the welcome pack has everything you need. There were no custom BIOS settings other than the memory being set correctly to 3,000MHz, and BullGuard was the only extra piece of software on the OS – thankfully it’s easy to get rid of. The warranty with this system is three years, but labour is the only cost covered for the full period; parts are fixed at one year and collection just one month. You do have options to upgrade to Silver, Gold, or Platinum level, though – details are on the website.